This covers the period 5 April 1915 to 29 May 1915. This volume comprises just 19 typed pages, starting at page 112 – part way through the entry for 5 April 1915 and ending with three lines of the entry for 9 April. The first 111 pages are missing and sadly we have no information about them. After two more missing pages (113 and 114) the diary starts with just one word from the entry for 13 April (page 115) and continues until page 132 which ends part way through 29 May 1915. Given that there are 111 pages missing it is likely that Edie’s diaries began in 1914. We now know, as a result of finding (in April 2009) three early letters from Edie to her mother (see anurseatthefront.org.uk/the-diaries/early-letters for more information) that on Friday 9 October 1914 Edie left Southampton and travelled, via Dungeness and Dover, arriving at Ostende at 3am on Sunday 10 October 1914. After a day or two in Ostende she sailed, she thought bound for Dover, but after anchoring off Dunkirk she arrived in Boulogne. By 9 December 1914 she was writing from No 10 Stationary Hospital which, records show, was at St Omer from October 1914. A third letter, dated 23 February 1915, is from No. 3 CCS (Casualty Clearing Station) which was at Hazebrouck at that time. No. 3 CCS was forced, by enemy action, to move to Poperinghe in April 1915 and then to Bailleul in May. Beaulencourt Sep 1918 – Oct 1918; Caudry Nov 1918 – Feb 1919. …answering each other’s ravings. One of them tells us he has been killed and does his mother know. Certainly death will be no stranger to him, when he comes in a day or two — or perhaps to-night. 3 ops. – 2 trephines and an arm. A field ambulance at Ypres was shelled last night, 2 orderlies killed, and 10 wounded, some fatally all the patients were transferred to us. So we have been very busy to-day. April 6th 2 cases in the theatre, heavy convoy in and out, worked in wards this morning. Gave the little orphans a tea this afternoon. We laid the tables for them. They came in and we came after, and as we entered they struck up “God save the King” in French. Then the eldest girl make us a little speech. Then they fed and we poured out tea for them, then they gave us a little concert, “Vive ‘l’Angleterre! Vive la France!” three cheers, all over, very happy — on duty again. Have not been out for 3 days, firstly because of much work, and partly weather, rainy and windy, not good for caps and tempers. April 7th Very busy day, going hard in theatre and wards until nearly 9 this evening. Very tired. April 8th Busy day, but only 1 case in theatre. Men who came in convoy to-day were in a terrible state of nervous collapse, a great many of them having been blown up in their trenches. Went for a walk after tea with Latham [This is Miss K M Latham, who worked at No 3 CCS with Edie, then went on to No 16 General Hospital. See separate page for Sister Kathleen Latham. Ed]. April 14th A Zeppelin was reported heading this way, but we have heard this morning that it has gone south. Off duty this evening, went for a walk and then looked over the College, where we are to move to to-morrow. No operations. Heavy convoy in and out and another convoy in since. Our Sgt. Major has got his promotion, and is now Mr Eanright. April 15th Quieter day. Taking over College to-morrow. There was a tremendous heavy bombardment last night. It only lasted three quarters of an hour, but it was impossible to sleep through the noise. I saw at my window and watched it all, gun flashes, ground lights and searchlights. It was all over by about 12.30. I heard to-day that it was covering our troops’ advance. April 16th Moved into the College, better in some ways, worse in others than the Benedictine; theatre not nearly so good. Not off all day. Heavy convoy in and out and another in. Hear that a Zeppelin that was sighted two night[s] ago dropped bombs on Bailleul, near the Sisters Qrs. No one hurt luckily. Am rather tired with charing all odd moments of the day. April 17th A taube [The Taube was The first German mass-produced military plane. Ed] that flew over here early this morning was shot down a little way away, the pilot killed and the observer taken prisoner, he was walked through the town, wearing an iron X. More taubes this evening. At present there is a big attack being made by our men, somewhere near Ypres, and a very big move and much flashing is going on too. It has been a frightfully busy day again, only 2 operations, an amputation and appendix. April 18th Sunday Our men made an attack last night, we heard the heavy firing (in fact it shook the houses) that covered their advance – in 3 mins. they had taken a trench and 13 prisoners 2 officers. The whole work of the night – was – a hill of importance blown up – arms and legs of men flung high – and into our own trenches – 6 lines of trenches taken and 2,000 prisoners. The Germans made a counter attack, and killed and wounded nearly 1,000 of our men, we have had over 600 through our hospital to-day, badly wounded, and fearfully collapsed, some who have been out since Aug. say it is quite the worst time they have had. We went on duty at 5.30 a.m. and stayed on till 9 p.m. I missed tea and dinner, because we were too busy in the theatre, but I came straight to bed and am having dinner from the officers mess brought up to me, and enjoying it very much. It has been a sad day in the theatre and a terribly tiring one. Amputation of arms and legs, and insides cut and packed in. Sir A. Boulby [This must be Sir Anthony Bowlby (1855-1929). In 1915 he was appointed Consulting Surgeon to the Second Army. Later, with the establishment of additional armies, new consultants were appointed, and Bowlby became a super-consultant and general adviser at the Front to the Director-General, Army Medical Service, and towards the end of the War, after Sir George Makins had retired, he became Adviser on Surgery for the whole of the British area, Front and Base. Ed] did one operation, another visitor another, to give our men a rest. Dr. Parbury from Sharnbrook came in once for one of them. Am very tired. April 19th The same as yesterday, only more; we have had more patients two heavy train loads and have been receiving all the time. Ypres is too dangerous so we get them brought in only a few hours after they are wounded. Theatre has been going from 9 a.m. I don’t know how many cases. One a young officer had both feet cut off, he was walking in Ypres and a shell struck him, he died soon after. April 20th Frantic day from 7 a.m. to 10 p.m. one long rush of badly wounded being admitted, 3 train loads have been evacuated. It is a wicked war. 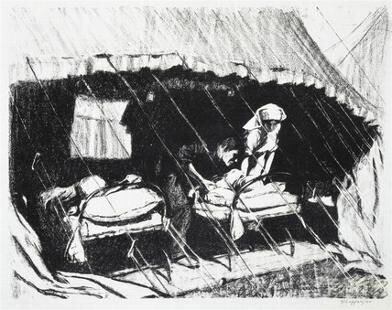 Officers and men – many so blown to bits that they just come in to die, many straight to the theatre for amputation of limb or limbs – or to have their insides – which have been blown out – replaced – and made a little more comfortable for the few hours left to them. The big ward is agonised groans and pleadings all the time and we feel we don’t know where to start for the hundreds of things to be done at once. Ypres is very much ruined and heaps of dead, English, French and Belgian are lying about in the square and all about the town. We hear the Germans have given up the hope of taking Ypres so they have decided to utterly destroy it. Now as I am to go on duty again at 6 a.m. I think I will sleep if possible. April 21st Another frantic day, on duty from 6 a.m. to 9 p.m. First in S. ward then in theatre for the rest of the day. I don’t know how any operations we had, lost count after 5 o’c. chiefly amputations. All the wounded are coming from Ypres and Hill 60, where wholesale murder seems to be going on, we have had 2,508 through in the 6 days. April 24th I did not go to bed yesterday, was in the theatre till early this morning, then bed[d]ed until 6 a.m. The war is raging terribly and fearfully. Shells! I can think of nothing properly. Wounded have been streaming in all the time, we have been strongly reinforced with Sisters, Doctors and Orderlies and still have to work night and day as fast as we can to keep pace or try to. It is a terrifying battle. April 25th The same as yesterday. Busy and terrible. April 26th Heavily bombarded again. 17 inch shells falling close round us. April 28th We were so much under fire on Sat, Sun and Mon that on Monday night we evacuated all but a few patients who were unfit to move and we (nurses) were ordered to clear out in half an hour, we were packed off at about 11.30 p.m. for St. Omer. Just as we were leaving the town, there were 2 more enormous explosions. We were not anxious to be sent away and told the authorities that we would rather stay, and since we had no choice, we could not help a feeling of gratitude, as we were whirled in a racing car out of the firing line. The first big shell fell quite close to our hospital, and the air was so thick with red dust, bits and smoke that we could not see out of our windows. We had operations on at the time and it was a little difficult for us all to go on as usual. After the first shock, we tried to become used to the 5 minutely explosions of a big shell close to us, but it was difficult and my knees did shake. One feeling which was strong in me at the time was that I knew people at home were …[Ed. A passage of the typed manuscript has been erased at this point] and if it were all right for us to live we should be as safe as … [ Ed. A passage of the typed manuscript has been erased at this point] We arrived at St. Omer at 2.0 a.m. a party of 20 refugees, were put up in a ward for the night, found stretchers and blankets all prepared for us. We did not sleep much, we were all too newly from it. Next morning we were returned to Hazebrouck, where we spent a muddly day, wondering what was going to happen next, and anxiously waiting for news of Poperinghe and our M.O. We hear to-day that the place is still being shelled, and that our unit No. 3 C.O. is being moved to Bailleul to-morrow where we are to join it. So to-day just for one day, after the fortnight of practically working night and day, we are having a rest, and at the time of writing we are in a beautiful wood just outside Hazebrouck, where we are going to have a picnic tea. It is very restful not to hear the roar of the guns so loud and near, but we know it is going on and our hearts are with the brave Tommies who are “sticking it” in the trenches. The day we had Jack Johnsons sent amongst us, an old Jesuit priest was very good to me and some of the others. He told us that if it were our lot to die, it would he an honourable death, and told us a very humble little prayer to use just before we died. I think he went round comforting every one like it. We are in very comfortable Qrs. here (Hazebrouck) 3 of us, the dear old landlady brings our breakfasts up to us, we go out for lunch, tea in the woods, supper a scratch meal in our rooms. It seems a long time ago we came, but after all it is only 2 days. To-day we shall if all is well, move on to join our unit at Bailleul. 2nd May We settled our wards and things to-day, we have one wing of a lunatic asylum, room enough to accommodate about 500 patients, the first of whom have just arrived, and the night nurses are up to look after them. Last night we were billetted in various parts of the town (Bailleul) and to-night we are sleeping at the asylum, our rooms are tiny, with high barred windows. Mine is minute, but has a pleasant outlook, over the aviation ground. The news today was not cheerful and from the roar of guns a big attack has been made to-day. Let us only hope our men have done well. I was grieved to read of a Zeppelin raid over Bury [St Edmunds. Ed], and am longing to hear if it upset Mother. May 4th … [A passage of the typed manuscript has been erased at this point. Ed] To-day has not been remarkable, 2 cases in the theatre. We are in such a state of “jump” that when a cork flew out of the stout bottle with a pop in our midst to-day, we all nearly fell through the grass. We have found a new mess room only about 5 minutes away, which is vastly better than 1/2 an hour. May 5th Very busy day, 5 cases in theatre and wards and wards full of gas poisoning cases. They are fearfully sad to see. The slight ones look rather like pneumonia, and the bad ones are terrible, the poor things are blue and gasping, lungs full of fluid, and not able to cough it up. 6 have died of it in one ward alone, to-day. I hear with sorrow that we have lost Hill 60 to-day, owing to our men being poisoned by gas. I also hear that we borrowed turbenite from the French and fired 4 rounds of it yesterday. Have not heard the result. I made myself a lovely table yesterday, about the size of the big round one in your bedroom at St. Augustine’s Road. There is a good deal of firing going on to-night, if only we could do really well and make the Germans ask for peace! We had a wounded German in yesterday, great cruel strong brute. The lunatics in the Asylum have been very noisy to-day, yelling and screaming and stamping about. May 6th Quiet day. This gas poisoning is a horrible business, a man told me to-day that it came like water out of a spout, a greenish yellow colour, some up trenches, and the men are killed at once and lie in heaps. It is only those who get less of it that are able to get away at all, and many of them die, it is most pitiful and painful to see them. 7th May Quietish day, about 12 minor cases in the theatre, no big ones. Monsieur le Directeur has made us a great offer, we may use the lunatics’ bath room twice a week, for one hour, which means 4 of us bathing at one time, there are 4 baths in one room. I don’t fancy bathing in company, but as I have not sat in water deeper than 1 inch since last year the temptation to go is great. I think 4 of us will try it tomorrow and see what can be done in the way of screens. May 8th Quiet day, but we are expecting a rush. There has been so much fighting, all our heavy guns have been in action, and there has been a more violent German attack than ever before, North of Ypres. Hear the Lusitania [see: http://en.wikipedia.org/wiki/RMS_Lusitania. Ed] has been torpedoed, with 1,500 people on hoard, wonder what America will say to that. Latham’s cousin who is in command of some R.E.s quite near here, called for her this afternoon in a little one horse country cart, and took her to cricket and tea and a band, invited me, but we cannot two get away for the whole afternoon; 3 of us went to another part of the asylum this morning at 7, and had a BATH – deep! Up to our necks in water – glorious! The first time for months and months! A dear old nun came trotting in when I was in my bath, felt to see the water was right heat, thought the bath was too full and pulled the plug by a patent in the floor, I was sitting on the hole where the water runs away and was sucked hard into it! I think I hear a convoy arriving now. May 9th A day of most terrible fighting; our casualties are very heavy they say, those of the enemy are heavier. Looking out of my window to-night I saw a fearful and wonderful sight – a clear moonless, starlight night, a strong cold wind. All along the ridge of hills which forms my horizon to ESE and NE was a continual sparkle and flash of light and the loud roar of guns. These are the star signal light-flashes from the guns, and searchlights going continuously. Letter from Mother telling me of the death of 3 officers and 2 men of the Buffs [The Royal East Kent Regiment. Edie’s family lived in Deal on the East Kent coast. Ed] – I knew quite well – the one I feel saddest about is Pte Ernest Wanstall [see page on Private Wanstall]. He cleaned our boots when he was quite a tiny – then grew big enough to take a place as chicken boy to a farmer’s wife, then he ran away and enlisted in the R.M.L.I. and came home a week later in his uniform, a funny little object, but the joy of his mother; she grew more and more proud of him as he filled out and was drilled into a fine upright fellow, so he progressed and was always the same nice, shy boy, very devoted to all of us. Now he is shot dead somewhere in France! I hear Italy has declared war. We have had a very busy day, 3 convoys in and out and a heavy one is arriving now. I had to “assist” with a head operation to-day, and in the middle Sir A. B. and Sir Arbuthnot Lane [Sir William Arbuthnot-Lane (1856-1943) became Head of Surgery for the British Army. Ed] came in to watch! May 10th Not quite such a busy day, only 1 operation. News is mixed one minute good the next not so good, very tired. May 11th Excellent news of French progress hope it is true. Slack day only 1 operation and no convoy in – one out. Off duty this evening. Glorious sunset in the W. looking like glory and perfect peace. In the East – heavy guns – and flashlights and dark clouds of war! For the first time I saw one of our aeroplanes being fired at – quaint! When it is us firing at their machines one’s only fear is that they won’t be hit, but when it is us being fired at it looked as if every shot will. May 12th I think I won’t write about to-day, it has been quite the last word in exasperation. Theatre not busy, but the wards overfull of very ill men – about 150 all clamouring for drinks and mouth washes, about 20 not allowed to swallow anything at all, clamoured loudest of all. Then a heavy convoy of very badly wounded were poured in upon us and later another convoy of wounded not so bad then the theatre again, then more dressings in the ward, then thank goodness an evacuation! and the poor old things were off on their homeward journey again and we were left – beaten and worn out. Rainy – busy – heavy firing – Frantic fighting going on at Ypres and many badly wounded Cameronians, Horse Guards, Lancers in – 1 op. Officer – very tired and late. May 14th 7 a.m. All the other 3 have gone for a bath, as we were on duty until past 10 p.m. I prefer for once in a way not to hurry so I am not going to. Still pouring – guns going – shall dress slowly now. 10 p.m. Busy day, fine weather, sunny and cold, big convoy in 2 Germans and 2 Indians amongst them. I was not busy after tea, so strolled in the garden and first watched 2 of our aeroplanes flying boldly and daringly over the G. lines. They rose from the aerodrome and flew straight to the G’s lines and were at once fired at – circled round, came back and flew over again and were again fired at. I watched the shells bursting, happily they all did well below the aeroplanes. Next I watched the sunset, which was beautiful a rich golden one. I usually watch it while we are at dinner, we have our door which leads to the garden open, and from my place at table I always get a picture of country and sunsets of all colours and shades. The birds are all now in full song, thrushes specially noticeable. The country is most interesting and less flat than at Pop. May 15th Rather less busy day. Went to town this morning, took laundry in to-night. Biggish convoy in, and many very badly wounded. The lilac is in full bloom and the garden and country lovely. May 16th 2 p.m. Slackest day we have had for a long time. 2 of us went off duty this morning and went for a walk to most charming country. Sat on a tree stump and ate chocolate and biscuits. Views all round very charming and the glass skylights on some of the houses in the towns sparkling like diamonds. An aeroplane flew over us close down over our heads, and the observer waved to us, so we did to him, wish he would give us a lift one day. I could tell you many tales of our patients, but they are so thick on the ground it is hard to choose. Light headedness has done a great kindness to one man now in the ward. His head is smashed and he will most probably die. He called to me just now and asked if he might see his wife once more before she went away, he said “I saw her and three of the children this morning, but I want to see her again,” I said “Certainly he might” and he went off to sleep quite contentedly. I remarked to him that it was very happy for him to have seen them, and he said, “Oh! It was! It was heaven.” He quite believes they were here, poor thing! One poor youngster was brought in yesterday stone cold – no pulse – perfectly sensible and horribly badly wounded. He just loved all that was done for him, his warm, clean clothes and hot bottles, and hot drinks, and pleaded not to be sent away with the others. I promised he shouldn’t be. He smiled very sweetly and went happily to sleep, and never woke in this world. But enough of this morbid side of things – they all die brave. War news is much better. May 17th Fairly busy day. Convoy in at 10 a.m. and driblets all day. No train, so we had a full hospital all day. I was on duty in No. 2 ward most of the morning. Had one case in the theatre a young officer with both legs very badly wounded and bones broken. 3 Zeppelins passed over close by at 4.30 a.m. the night people watched them, one was going very slowly and looked as if it had been hit. Our aeroplanes were up and after them and signalled to the next aerodrome to do the same, I only hope they were brought down. No off duty time. News if true is good. 18.5.15 Quiet day. Candle just going out. May 19th Ypres is dead – a silent town of broken and burnt houses and destroyed streets – unburied bodies lie all about the place a scene of utter desolation. A few of our Military police are stationed there and an occasional shell comes over – otherwise all is finished. A Padre who drove through there yesterday told me about it. We have had a very quiet day only admitted a few sick, but by the sound of things wounded are coming now. 10 p.m. A man who was brought in 3 days ago shot in the spine has been dying by inches – nay sixteenths of inches ever since and is not dead yet. His brain and abdominal muscles are the only unparalysed parts of him now. I was off duty this afternoon and went for a walk with Miss L. in the rain – and much mud – most refreshing after being indoors so long. Guns are firing hard again to-night. May 20th Admitted 2 convoys during the night, so ward was full when we went on duty, evacuated at 12. Slack since, no theatre, off in the afternoon went for country walk with L. Sat in hot sun and read paper and my Omar Kyaam [Edie was probably reading Edward FitzGerald’s Victorian translation of around 100 poems by the 11th century Persian scholar, which became known as the Rubaiyat of Omar Khayyam. Ed]. It was lovely, lots of birds singing, aeroplanes flying about, buttercups and daisies full out. I have heard for the second time that Italy has declared war. The aeroplanes look like great live birds – they squat on the ground, then rise, and soar high and skim about and in a few moments dive to earth again and settle – then off again. It only takes them a few moments to reach the German lines, and they seem to fly there, see what they want to and home again, then go to spy out something else. I am going to bed now. The spine man died this evening; his brain was the last thing to lose its senses. I have never known a more sad and slow death, poor man he was talking to me about an hour before he died. 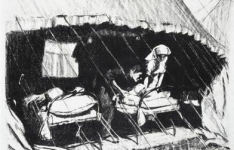 May 21st Quietish day, patients chiefly medical owing to the weather came in in driblets, and we still have in about a dozen abdominals, some getting better, some dear cheerful brave things – dying slowly. Whenever I have a very ill patient generally abdominal, I always give him my handkerchief, a clean one, I don’t know why but they love to have it. When I gave it to one to-day he said he hoped he would not be sent on from here. I was like a mother to him! poor thing and only because I gave him a handkerchief. We went for a walk in the rain this morning towards where “Grandmama” is hidden – spitting fire like a fury – at the Germans. Bed now. May 22nd There is vivid lightning and thunder and heavy gun fire and flashes, and the half moon shining to-night a queer mixture of things, peaceful and terrible. The ward was quite full when we went on duty this morning, but we evacuated early, and have not taken in since. Gloriously hot day. Off in the afternoon, fetched washing then sat in lilac patches until tea time. May 24th Col. Bewley came to tea, and told us that Bailleul is to be shelled in 3 days time. I felt frightened at the thought but do try to make myself realise that God is over all and can stop it, or keep us safe or do just what He likes. Only 13 patients in until this evening, all very trying ones, terribly fidgety. We are now taking in. 3 p.m. In bed for night duty. Ugh! May 25th Had quite the busiest night imaginable. The Germans poisoned hundreds of our men yesterday, and we had our hospital full, and emptied and over filled again at once. Men lying on stretchers in the garden, and thick in the grass, even filled a patch known as the duck pond. The cases inside were very bad indeed, and died like poor flies all night. We evacuated at 2 a.m. and promptly filled to such an extent that I had 163 in a ward supposed to take 60, as well as 16 very bad officers and 3 ward sitters. “I cannot – cannot cannot” said the dying boy “Ye canna – what?” asked O’Neill the Irish orderly, “I cannot…pray” repeated the boy. “Ah thry…” persuaded O’Neill, “twill make ye barra” (better). Quite true I listened to it all. Bathed in the asylum, went to breakfast, was invited to a drive but had to decline owing to inclination for bed. May 26th Another very busy night. Found ward quite full of wounds to be changed and dressed, and all demanding drinks every 5 minutes. To complete things we evacuated 150 at 2.30 a.m. and at 4 filled and over filled again, with badly wounded, so had the double dose of changing &c. Two taubes and a Zeppelin passed over us last night, we think the Zep. must have dropped an incendiary bomb a little way off behind the trees, about 2 miles perhaps, we saw a huge flare of fire in the sky. Came off at 8.30 and found Col. — little cart waiting to take us for a drive. We went for 2 hours, all round by Locre [Now Loker, as it belongs to the Flemish community. Ed] Rein-something [Now Reningelst (then: Reninghelst) .Ed] &c. and saw countless columns of artillery, R.G.A., R.F.A., R.H.A. I suppose all going to the front. People found us rather an unusual sight and stared and saluted and some went so far as to cheer. Home at 11 and now in bed. May 27th Quiet night. Went for drive, gramophone now playing in Officers Ward which I want to listen to. You would love the music. May 28th We saw another huge blaze of fire over towards the German lines last night, but have not heard what it was. An awful accident happened near here yesterday afternoon, one of our own hand grenades factories blew up by accident, more than 1,000 many civilians and some Tommies were killed and we had in the wounded. One died in the night, they were horribly badly wounded. We heard the explosion at 5 p.m. and hopped out of bed to see what we could, and saw a huge column of grey smoke, solid and high in the air. Busy night, small convoys coming all the time. This morning after a bath at the Asylum we walked into the town and bought things. Feel news in general very depressing, we don’t seem to be gaining anything at all, but we must take what comes to us after doing our best. Another ship lost the Dardanelles too! Wish the war was over and we had won. As mentioned at the beginning, this typed volume ends abruptly at this point and we have no idea how many pages are missing. Volume 2 starts just eight weeks later on 25 July 1915 with the words “Just back from 10 perfect days leave…” so the missing pages probably cover a period of about six weeks or less. If anyone reading this website knows the location of the missing pages or any later volumes – perhaps in a secondhand bookshop or even in a museum collection – we would dearly love to hear from you; please contact us via the Visitor’s Book.